This page is dedicated to my Beloved Grandmother Mary. She prayed for everyone and never stopped beleiving in the power of the Holy Spirit that no matter how long you pray, the Lord will answer! She never gave up! Her prayers are what got Sharp Poms where it is today and without her support and love it would not be. But the Lord heard her prayers (and mine) and blessed us greatly! So this page is just a little glimpse at the kind of lady my beloved angel was. The one thing I know for sure is that my Grandmother loved Jesus with all of her and soul! She prayed for us kids for many years, never giving up on us when we would fall or sin. She was always kind and loving, never judgemental or harsh. After all of her years of praying her family accepted Jesus Christ as there Lord and Saviour and now we also tell our children about Jesus! THIS FAMILY TRULY LOVES JESUS and it is because of the endless prayers of this beloved saint! I Praise The Lord for allowing this amazing woman to be a part of my life. She has taught me so much the memories I have of out time together and the conversations we have shared will last a lifetime! This beautiful picture taken on my Grandparents wedding day! She was so beautiful and he was a handsome young man! My son, and the family namesake is the image of his Great Grandfather. And before he passed away ther Lord allowed him to witness one event in the life of my son. One Birthday Party, One Christmas, One Easter, One of Everything. He even walked into the Church just as my son was getting babtized! God is so good! 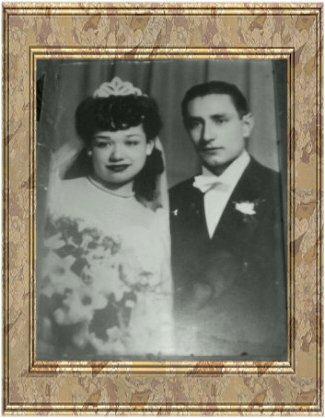 They were a happy couple, who truly loved each other and were married for over 40 years! Both giving and caring people. I LOVE THEM BOTH DEARLY!
. I loved spedning time with her. When I was a little girl and would spend the weekends with her and my Grandpa I would get shopping bags and "Go Shopping" in her kitchen cupboards! She thought it was the cutest thing! I would always take Malt O Meal, Postum (I use to think I was a big girl drinking Postum with my grandpa) and those square sugar cubes from her sugar dish. She asked me a few days before passed away if I ever found anything interesting in there and I said "Grandma you know I loved my Malt O Meal"! She would just laugh and say "I love you Meja". She would wake up early in the morning and make me a soft boiled egg, I loved those and only she could ever make them just right! She taught me how to make Menudo, and her famous family recipe Tamales!!! The best you would ever taste! She made THE BEST spanish rice in the entire world (to our family) and just anything she cooked was DELICIOUS! 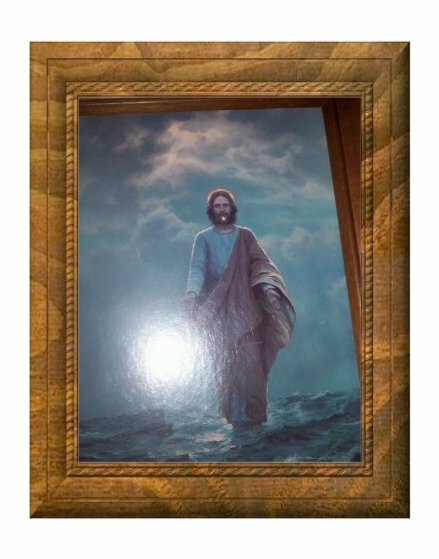 This beautiful picture of Jesus walking on the water was one of my Grandmothers favorites! She gave it to me a few days before she went on to be with him for eternity. I cherish this picture very much. And now me and my family have the honor of having it passed down to us.